neotype. not holotype. I got told off by certain quarters for mixing that up once. I don’t think so. Those bones have always been the holotype of the species Cetiosaurus oxoniensis — nothing’s changed there. All that’s changed is what species is the type of the genus Cetiosaurus. oh, my bad! I misunderstood. Well, oxoniensis is now the type species regardless of what I write, but let me play Devil’s advocate here. You ask “Why would anyone vote against?” Top reason- Owen named Cetiosaurus based on medius in 1842 long before the oxoniensis type was found in 1868. medius seems to be a titanosaur/somphospondylan, whereas oxoniensis is a non-neosauropod. So Owen’s animal was different but had its identity transmogrified long after his death. Imagine this happens to one of your taxa. Say in 2033 researchers find a partial skeleton they think shares characters with Xenoposeidon and name it a new species of that genus. For decades people use that specimen as the Xenoposeidon exemplar, but then it turns out the specimens aren’t that closely related. Somehow the ICZN still exists (the Phylocode is scheduled to be published on January 1st, 207N), and the relatively unrelated specimen found in the 2020s is now the holotype of Xenoposeidon. How is that fair? How is that representative of your concept of the taxon? It’s basically excusing laziness and/or incorrect reasoning with nomenclature. It wouldn’t be so bad if all cases were like Cetiosaurus, but this has become such a shortcut in dinosaur taxonomy that I’m disturbed. The species taxonomy of Allosaurus hasn’t been examined recently (with Chure’s 2000 thesis being a necessary starting point), but Paul and Carpenter (2010) already petitioned the ICZN to make USNM 4734 the neotype of A. fragilis. Stegosaurus’ holotype has never been described in depth, but after a superficial review of synapomorphies proposed by one paper (Galton, 2010 reviewing Maidment et al., 2008), it was petitioned by Galton (2011) to have stenops be the type species. Not even a chance to have other stegosaur workers disagree. Most recently, Galton (2012) petitioned the ICZN to make trossingensis the holotype of Plateosaurus, because the specimen is an incomplete skeleton vs. a skull (for longiceps) and the type quarry is still open. Why pretend we have a principle of priority when it’s a principle of completeness? “Fair”? Who said anything about fair? The goal here is “sense and stability in nomenclature” as per the ICZN’s motto. That’s best served by reifying what’s already the universal usage of the name “Cetiosaurus“, not by being fair to Owen. Same thing in my case. If some other animal gets universally adopted as what people mean by “Xenoposeidon“, that’s unfortunate; but once it’s happened, it’s pointless having the ICZN keep insisting that it hasn’t. First, I erred in saying medius was a titanosaur. I was thinking of brevis. Part of my problem with the Cetiosaurus case is that its authors could have decided otherwise and not led to much taxonomic disturbance. Sure Cetiosaurus was historically important, but between Huene’s era and 2002 it wasn’t that relevant to sauropod studies. It was the Megalosaurus of sauropods- not studied recently, a wastebasket taxon, with no obvious described autapomorphies, thought to have a vague place in cladograms but not included in most phylogenetic analyses. So when Upchurch and Martin (2002, 2003) restudied it, they could have said C. medius was trash and thus oxoniensis gets a new genus. Then we’d have two big papers on this new genus, it would have been included in all the new analyses, and things would have been fine. Just like how most theropod workers were fine in the 90s using Spinosauroidea and Torvosauridae when they thought Megalosaurus was trash. But instead they recommend using oxoniensis as the type species and say they plan to petition the ICZN, so of course everyone follows their lead. And by the time they petition the ICZN in 2009, it would indeed be problematic to associate Cetiosaurus with medius instead (note half of the references to oxoniensis being used are from after 2002). So basically Upchurch and Martin caused much of the problem their petition then fixes and encouraged the creation of much of the evidence supporting their position (e.g. “no other generic name has ever been proposed for C. oxoniensis; nor has it ever been referred to as ‘Cetiosaurus’ oxoniensis.”). This seems off to me, though we’re stuck with Cetiosaurus oxoniensis now. I wonder if anything will ever come of it? Oh goodie, a new ‘pod. When do you think you’ll have the paper finished, Mike?! Mark — just to be clear, I have no plans to reassess the Rutland sauropod, because (A) I already have a big backlog of descriptive work, and (B) the people to do it would be Paul and John, who know that animal inside-out. Mickey, I think you’re way off base in this one. You rightly note that some of the papers we cite as using the name Cetiosaurus to refer to C. oxoniensis come after the Upchurch-and-Martin papers of 2002/2003; but even if you ignore those you have to consider the prior art established by Owen,1875; Hatcher, 1903; Huene, 1904, 1927; Fraas, 1908; Janensch, 1914, 1929; Matthew, 1915; Coombs, 1975; Wild, 1978; Bonaparte, 1986, 1999; Martin, 1987; Upchurch, 1998; and Casanovas et al., 2001. Plus whichever other papers we missed. It seems clear to me (which of course is why we wrote the petition, and why Paul and John took the actions they did in 2002) that the meaning of the name Cetiosaurus was already well established; and, crucially, it was unanimously established. No-one was using it in any other way. I don’t dispute that the concept of Cetiosaurus was primarily based on oxoniensis by 2002, only that it wouldn’t have mattered much at that time if Upchurch and Martin went against this, and that they greatly stacked things in their favor by 2009 based on what they did in 2002 and 2003. No one used Cetiosaurus as medius instead of oxoniensis prior to 2002 because Upchurch and Martin were the first to examine the species in a modern context and thus figure out they don’t share apomorphies within Sauropoda. Only once this was established could anybody even conceive of disagreeing, but now they would have to go against the people actually working on the taxon, two major descriptive papers on it, and an IZCN petition they knew was coming. Here’s a question I’d be interested in learning the answer to- When was the last time a Mesozoic dinosaur’s ICZN petition was rejected? I can think of Coelophysis, Cetiosauriscus, Archaeopteryx, Iguanodon, and now Cetiosaurus. All passed. So if someone reputable declares they’re going to petition the ICZN, is it realistic to oppose them? The answer could be depressing given the recent petitions for Allosaurus, Anchisaurus, Plateosaurus and Stegosaurus. 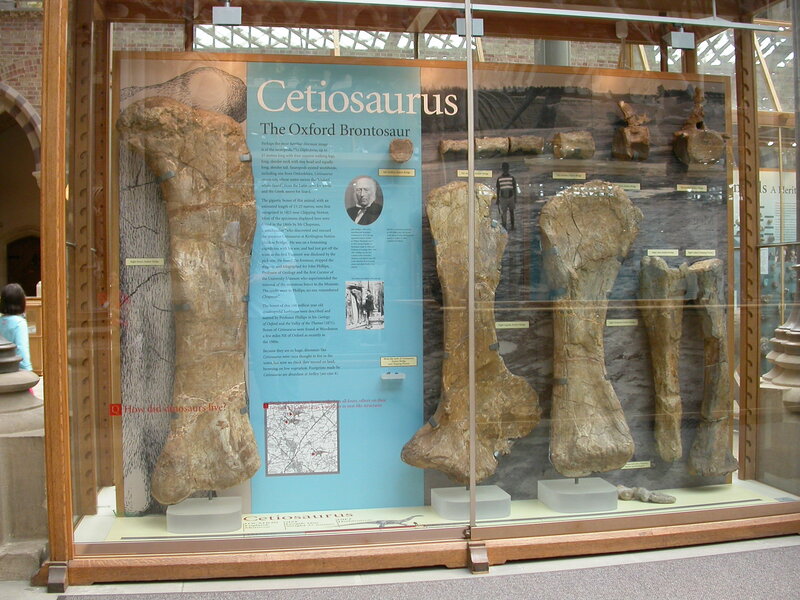 I don’t dispute that the concept of Cetiosaurus was primarily based on oxoniensis by 2002, only that it wouldn’t have mattered much at that time if Upchurch and Martin went against this. Once more I refer you to the ICZN motto: “Standards, sense and stability for animal names”. Thanks for clarifying, Mike. Hopefully Paul and John have it on their “To do” list.